Introduction and Runners-Up. Shoutouts to great shows that just missed our Top Ten list for one reason or another. Bonus: Five beloved shows we did NOT consider adding to the list, and why we think they are poo. #10: “Six Feet Under.” This series introduced viewers to the unforgettable Fisher family, proprietors of a Los Angeles funeral home. For five brilliant seasons, we laughed and struggled with the characters as they confronted their demons and sought happiness in the face of sorrow and death. #9: “It’s Always Sunny in Philadelphia.” Here’s a show that features zero character development, the attention span of an eight-year-old and no moral compass whatsoever. Who cares? It’s “I Love Lucy”-level comedy goodness. #8: “The Daily Show.” A consistently funny and thought-provoking show that delivered the decade’s best media criticism and repeatedly drew attention to the elephants in the room that were poised to trample us all. 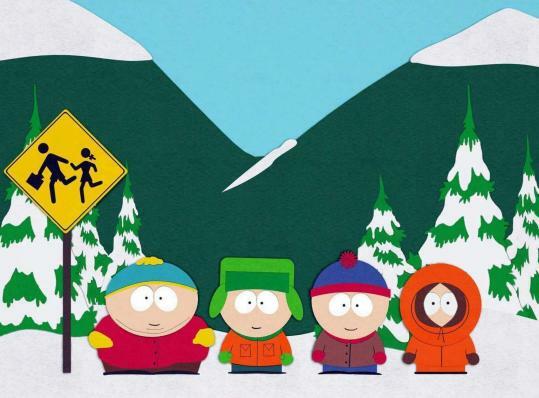 #7: “South Park.” One of the most daring pieces of satire ever. Attention misguided souls who associate “South Park” exclusively with potty humor, offensive jokes, and cussing: read this and you might learn something. #6: “Mad Men.” One of the very best shows on television for the past few years: a gorgeously-shot drama about advertising executives and the women who love them.Its flawless art direction, terrific ensemble cast, and engaging scripts have made it a pleasure to watch through three superb seasons. #5: “Arrested Development.” Without a doubt, the funniest television series of the decade: a show that rewards first-time viewers with a variety of gigglesome characters and situations, but that’s so skillfully composed that it only gets better with repeated viewings. This show is so awesome, it even makes puns seem cool. #4: “American Idol.” No overview of the decade in television is complete without a hat tip to its influence and success, and if you think this show is lame, either you have never really watched a season, or you’re just an insufferable snob. “AI” created megastars, consistently lived up to its billing, entertained millions, fueled a rich and varied Internet subculture, and never stopped evolving. #3: “Lost.” So many mysteries, so many questions. So many great episodes, baffling cliffhangers and amazing reveals. “Lost” does it all: creating a complex web of narratives, consistently changing things up with plot twists and cliffhangers, and introducing one compelling new character after another. #2: “The Sopranos.” This masterful series might be the most important television show of all time: it is largely responsible for the explosion of great cable programming that includes seven of our top ten choices and marked the aughts as a magnificent television decade. For all its importance to television history, however, its most vital quality is that it is tremendously well written, directed, acted and edited. #1: “The Wire.” In our opinion, this is the greatest television show ever made. In its scope, seriousness, ambition, performances, writing, photography, and economy of narrative, it is virtually unparalleled. This show blew through the rubble of the walls torn down by “The Sopranos” and delivered to its viewers a story that was more urgent, more complex, more heartbreaking, and more relevant than any ever told before on television.